We have probably seen most of the bills that will be filed in the 2017-2018 session of the Georgia General Assembly. Our staff has gone through all pending legislation (almost 3,000 bills) and pulled out the ones that are of most interest to us. Update – Dead for 2018 but will come up again next year merged with Horse Racing. Both bills seek to make it clear that the holder of the license is not a citizen of the United States. Still excludes places currently off limits (jail, courthouse, etc.). – Since objects or instrumentalities in and of themselves are not dangerous or evil, in a free and just society, the civil government should not ban or restrict their possession or use. Why isn’t this getting more press? If petition succeeds, initiative will be on a statewide ballot. Conference committee member can’t get job in state government for 24 months. All dead for 2017/2018 session. Deposits to a savings account enter depositor in a raffle. And don’t call it gambling. 14 other states require a criminal conviction in some or all asset forfeiture cases. Nebraska, New Mexico, and North Carolina have abolished civil asset forfeiture altogether. 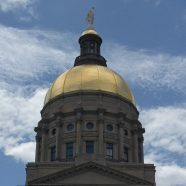 Preservation of religious freedom – Very simple bill which just says that provisions of the federal Religious Liberty law should apply to people in Georgia. Opposition citing Amazon, but most of their top states (including home state of WA) have RFRA. Creates a referendum to Amend the Georgia Constitution and designate English as the official language of state government. Why is this a Legislative issue? Free speech on campus: Rallies, protests and free speech on university campuses would be allowed in public areas without many restrictions. Protects “unwelcome, disagreeable, or even deeply offensive” speech without a need to give notice of events in advance. Anyone who infringes on someone’s First Amendment speech rights could face a fine of $1,000. All three bills add additional punishments for crimes committed against protected classes – race, religion, national origin, sexual orientation, gender, gender identity, mental disability, and physical disability. An assault is carried out by a threat of bodily harm coupled with an apparent, present ability to cause the harm. So some protests, if bystander feels threatened, could become a hate crime. If you like the race or gender you attack will you get a lighter sentence? Net neutrality was intended to force internet carriers to treat all content the same. Before expiration in 2015 you could actually lease a Leaf for NO money after all the tax credits and deductions. HR 969 (Billy MitchelL – D) Ratify the E.R.A. HB 673 – Distracted Driving. Would make it illegal to hold a phone in your hand, under your chin, or even place it on your leg. The Texas A&M Transportation Institute study published in Scientific American a study showing that Hands-Free Texting Is No Safer to Use While Driving. And neither is hands free calling. So either ban cell phone use or allow it. Passed on second vote in house Yea(151)Nay(20). Gives the same break for a car museum up to $1 million. Again – giving specific tax breaks to certain companies and not others. Smells fishy! Passed both chambers, and the very next day GA Aquarium announced expansion. However in testimony made during the committee hearing the aquarium admitted they would expand even without tax break, so this give away was completely unnecessary. Except for all members who now have a free lifetime pass to the exhibits. House Bill 978 (Chad Nimmer R) – Authorize “automated traffic enforcement safety devices” in school zones. This would allow automatic generation of speeding tickets. First school zones, then where else?